FAA Part 107 Study Guide - $50 OFF Coupon / 97% Pass Rate ! In the midst of new laws and regulations revolving around UAVs, the time has come to take an in-depth look at all of the potential issues new pilots might come across. 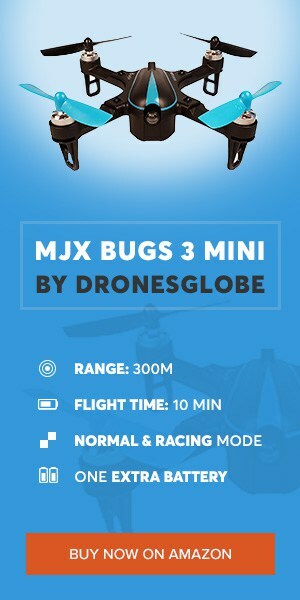 With the drone industry skyrocketing, it is not at all surprising to see more and more regulations taking place, not only in the US but the rest of the world as well. So, what does it take to become a licensed drone pilot and where to start your FAA Part 107 test prep? Unfortunately, a short answer that covers the entire question does not exist. Instead, I will take you through the entire process from the first steps (FAA Part 107 training) all the way to your very own FAA drone license. Mind you, the road will be tough and there’s going to be a lot of stuff to learn and get accustomed to (luckily, FAA part 107 practice test is available online and we have a discount for you!). See, let’s see what this FAA Part 107 Study Guide has to offer! The process (especially the test) is quite demanding so do not (I cannot stress this enough!!!) take it for granted. It’s a common mistake, but in the end, I am sure that, with a little effort and motivation, you will succeed and get your very own remote pilot in command certificate that will open the door for many job opportunities. What do I need to do after purchasing a drone? In 2016, due to the amazing popularity of drones, FAA (Federal Aviation Administration) had to come up with certain laws that could regulate small UAVs. There was just so many of them flying around without any concrete rules to guide them. It becomes more and more obvious that those days are long gone. With these new laws and regulations, small UAVs now require registration before having their first flight. The process is quite simple and is completely doable online, without even getting off the chair you are currently sitting on. What you’ll need to do is visit registermyuas.faa.gov and follow the on-page instructions to register your drone. Near the end, you’ll come across a screen where you’ll need to pay $5 (registering fee) after which you will be granted your very own registration number. FAA requires you to print this number and place it on a visible spot on your drone (I slid it on the bottom side of my P4) that can be accessed without using any tools. That’s pretty much it – once you do all of the above, you are ready to fly your drone as much as you’d like… But keep in mind that this procedure works for drone weighing between 0.55 and 55 lbs. For anything above 55 (trust me, there are plenty of heavier drones out there), the registration procedure is much different. Another thing to keep in mind is that you are only allowed to fly your drone for causal use. For commercial purposes, you will have to get an official license which will take much more time than this online registration procedure. This is due to a specialized test that you will have to pass in order to get your commercial drone pilot license. More on that right down below! Do I need FAA Drone License and how much does it cost? If you plan on piloting your drone for commercial purposes, then the answer is yes – you do need a remote pilot certificate AKA commercial drone pilot license. It’s a standardized exam that will test your knowledge about drones as well as everything regarding them. Don’t think of it as a formal thingy because you will be shaken to reality by a cold hard slap worth $150. Yup, Part 107 test will cost you roughly $150, that is if you pass it from the very first try. If you underestimate its difficulty and come unprepared (and trust me, I’ve been there on that side of the story as well), you will fail and be forced into paying $150 again to retake the test. In addition to extra cost, you will also have to make a 2-week pause before being able to take it again. How to get a drone license and become a drone pilot? In order to get the FAA drone license, you will need to take a specialized test that’s held all over the States. More precisely, the test you will have to take is called Part 107 Knowledge test and it’s available in close to 700 locations (696 to be more precise). The registration can be done via phone (you can simply call your closest testing center and arrange all the details such as date and payments) but you will still have to take the actual test in person at one of those locations. Before taking the actual test, please consider taking one of Drone test prep online courses. The task at hand might seem like an easy one at first, but if you start doing some research on this topic you will find out the test is rather difficult. I know more than a few people that had low expectations and studied during the last night before taking the test. Needless to say, they failed and were shocked at the difficulty of certain questions. If you want to make the task easier, you can always go to one of those FAA Part 107 Practice Test preparation courses online. These Part 107 test study guides are providing their students with unique, one-on-one learning scheme where everyone can get Part 107 training tailored specially to their own needs. 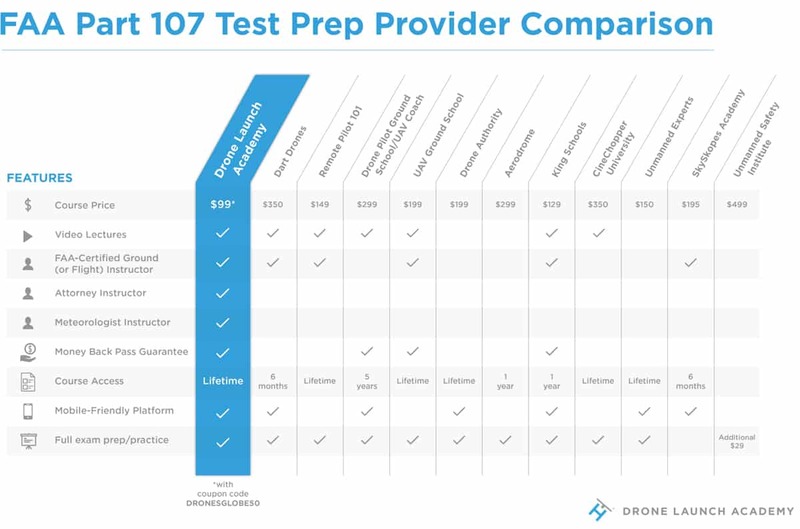 Part 107 prep tests are included within courses such as DroneLaunchAcademy.com (Use DRONESGLOBE50 for $50 OFF). They offer great amount of valuable information including quizzes, videos, documents, infographics and final exams that will thoroughly assess your knowledge across all subjects that will be in the test. So far, their students have a high passing rate so it’s definitely worth a shot! There are other online prep courses as well. Some of them are even more thorough than Drone Launch Academy but they cost much more. There are cheaper ones as well, but they’re either partial (they focus on one or just a few topics that’ll be in the test) or meant for people with a history with flying unmanned aircrafts. That’s why, if you want to get your drone license and become a drone pilot, I would say it is a must to sign up for one of these online courses. Without them, I doubt you will stand a chance at the test – it’s just too damn difficult, mark my words! What is a FAA Part 107 Test? Part 107 is a specialized test made by the Federal Aviation Agency. The goal of this test is to ensure commercial drone pilots know their way not only with piloting drones but with all other relevant in-flight information as well. Additionally, this test also wants to make all new commercial drone pilots prepared in cases of emergency where quick actions and sheer knowledge could prevent injuries to pilots or those surrounding them. Ideally, FAA aims to drastically improve safety in commercial drone flights with eyes set onto the future where drones will take up even bigger part of our lives than they are today. Before taking the actual test, please consider purchasing one of FAA Part 107 test prep courses available online. It will drastically increase your chances for passing. If you want to save some money, we have a $50 OFF coupon (DRONESGLOBE50)for DroneLaunchAcademy. How to prepare for the FAA Part 107 test? A proper drone test preparation is the key to successfully passing the test. I know for a fact that many people greatly underestimate it and end up failing miserably. In fact, 2 of my close friends have had this happen to them. They were foolish enough to think the FAA would make an easy (I believe “formal-only” is the term they often used before taking it for the first time) test that wouldn’t require any (or little) studying. Those extra $150 I already told you about really taught them a valuable lesson. So, if you do not want to be like them, I would suggest you take up one of those online Part 107 preparation courses. All of them will set you back for relatively high sums of money so it’s important to choose which one to go with. If you ask me… and you should definitely ask me since I’m sort of an expert when it comes to drone (I’m not trying to brag here but I’m one of the first people that gained remote pilot certificate), Drone Launch Academy is an excellent choice. It’s not that expensive yet it covers all important topics that will make their way into the test. My favourite drone test prep course, definitely. Ideally, what you should look for when searching an online course are video lessons, Part 107 questions (there are plenty of those available, I can assure you), one-on-one studying scheme (if necessary) and even trial tests that will assess your current level of knowledge. Also, keep in mind that you should look for a complete preparation course that touches each and every one of the below stated areas that will be included in the Part 107 test. As you can see, regulations are the focal point of this test and as such, they should be thoroughly examined. With 60 questions in total, approximately 10 to 15 will be revolving around various FAA regulations. Considering the fact that you need to score at least 70% (equivalent to 42 questions), it’s safe to assume you’ll most certainly fail if you don’t invest a lot of time and effort into studying small UAV regulations that have been made by the FAA. I’m sure you now understand that I wasn’t scaring you for nothing – Part 107 Knowledge Test is indeed very thorough and demanding. It’s not meant to be considered as a mere formality. Quite the contrary actually, it’s meant to test your total knowledge about drones and everything else regarding them. But, considering the sheer amount of jobs you could land after getting your FAA pilot license, a difficult test is just a small bump on your road to success! Are there any FAA Part 107 study guides available online? As I have already mentioned a couple of times throughout this article, I believe Drone Launch Academy is one of the best FAA Part 107 practice test guides out there. Not only does it provide video courses in Regulations, Radio Communications, Airspace and more, but they also put you up against demanding quizzes with actual questions from the Part 107 test. Combine that with the excellent passing statistics from their students and you’ll begin to understand why I’m praising them so much. Partially, I’m doing it because they’ve helped me with my test preparation and partially because I truly believe they offer best value for money out of the bunch. So, if you’re looking for a complete prep guide, you can’t go wrong by choosing them! There’s also a money back guarantee on Drone Launch Academy saying you will get your money back if you don’t pass a Part 107 test after taking their preparation course. Sounds cool, right? You have nothing to lose! What does the Part 107 test look like? In the next couple of lines, I will give you some insights about the actual Part 107 Knowledge Test. Rest assured that this is not classified information and it is widely available on the internet. I am just gathering it here so you have everything at the tip of your fingers. Mostly FAA regulations revolving around operating small unmanned aircraft. Including airspace classifications and operating requirements. How do certain weather conditions affect your ability to operate a small unmanned aircraft. Represents math behind maximum takeoff weight your drone can safely hold in the air. Various emergency procedures that will minimize the risk of injuries. Short for Flying Under the Influence. This section will teach you more about dangers of flying UAVs while under the influence of various drugs and alcohol. This part revolves around properly maintaining your small unmanned aircraft and doing all safety precautions during preflight inspection procedures. Read the instructions carefully! There will always be a few trick questions that will serve as shaving off extra points from your end result. Make sure your answers consist of only the latest regulations and guidance publications, otherwise they’ll most likely be incorrect. Keep your eyes on the clock! Remember, you have 2 hours to complete all 60 questions. It might seem like a lot of time at first, but once you get “into” resolving them you’ll realize how quickly time flies by. At some point during the test, you will come across a question that seems to have more than 1 correct answer. Don’t let that fool you! There is only one 100% complete answer and the others might serve as tricks to make you lose points. If you are not sure about a certain answer, mark it for review (your assistant will explain the review process before the start) and come back to it after you’re done with all others. In this part of our FAA part 107 study guide, I will show you a couple of Part 107 test questions as well as their respective answers. Correct answers are marked green. Q: It is 7:00 am. Official sunrise is at 7:40 am. Your UAV does not have any anti-collision lighting. How long do you need to wait before you can fly under Part 107? Q: If the center of gravity on your aircraft is too far aft (rearward), what is the likely result? 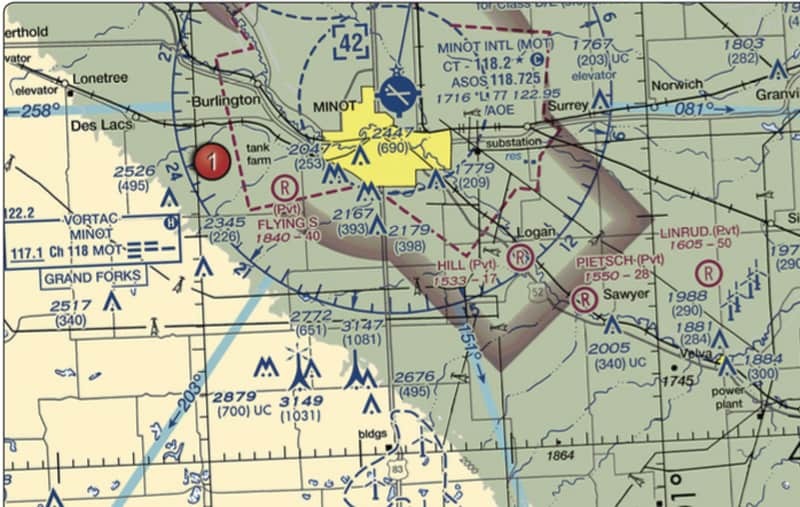 Q: (Refer to FAA-CT-8080-2G, Figure 21, area 1 [see below]) How tall is the tallest tower in the group of towers to the south of Minot International Airport? “Having had no prior airmen training, I went into the test the first time only reviewing the study material that the FAA provided. I thought to myself, “I’m a good test taker, I scored high on my SAT. How hard could this be?” Needless to say I was in for a rude awakening, and promptly failed the test. Frustrated, I went home and began to study the same material, the same way again. I was the very definition of insanity. My father suggested that I enroll in a drone test prep course and said that I did not need one. But finally age and wisdom won out, and I enrolled in Drone Launch Academy. So, I signed up and per my personality (impulsive and determined), competed the entire course in 1 day. When I say the entire course, I mean the entire course; videos, documents, quizzes, tests and all!I went from a 58% on my first part 107 test, to an average of 90% or better on all the quizzes and test provided by DLA! But, I am a sceptic at heart. I decided to find other practice tests online and see if I could pass them…and I did with an average of 86%! “Drone Launch Academy helped me go from no prior knowledge about FAA regulations for UAS operations to passing the Part 107 UAS certification exam on my very first attempt! Jobs for licensed commercial drone pilots? Given the fact that the entire drone industry is blooming, it is not surprising at all to see many organizations looking for commercial drone pilots. Such job openings are endless to the point that USA, at the moment, needs to import remote pilots from abroad. So, if you are a teenager (keep in mind that you must be older than 16) looking for an interesting, well-paid career, a middle-aged man ready for a career-change or a senior citizen looking for extra bucks to give your grandchildren… drone piloting might be perfect for you. As I’ve already stated above, all it takes to get your remote pilot certificate is to pass that Part 107 test. After that, the biggest problem in your life will be choosing a job in certain field. And trust me, there are more implementations of drones in industries than you could ever imagine. From roof inspection, real estate, agriculture, cinematography and security companies to environmental mapping, filmmaking and many more… It’s quite clear that drones are becoming the next big thing in the world of technology and are definitely here to stay! As you could see for yourself, getting all the necessary things ready and, in the end, getting your drone piloting license seems more complicated than most of you initially thought. Luckily, everyone working for FAA is amazingly kind (and I stand by this 100% since I enjoyed more than few positive meetings with them) and will make sure you understand everything in due time. When it comes to the test itself, there is no reason to be afraid. It might be thorough and extensive but with a lot of studying and repetition, I’m sure you will do just fine! I just took my 107 test on the 12th. I think they have changed the test. I studied for over two months. Bought the books, had the app, hours of YouTube and lots of study guides. I saw several lists of percentages of types of questions. What I had was nothing like that. My guess was about 50% of the test was sectional charts. Several questions about things I had heard never read or heard of. Like a special test you take when you feel tired to tell you if you should fly and others. I did pass the test with a 77%. I guessed at many questions that were about things I never saw in the study guides. And I am a private pilot. I'm just letting you know so it might be worth checking out. I was really surprised and was wondering if they are making the test harder on purpose. I spoke to several of my friends that have taken the test earlier this year. They were surprised at what I told them. No need to answer and hope this helps if it is true.